Winter storm Stella is taking aim at parts of the Northeast U.S. this week and could dump as much as 18 inches of snow in some states. It’s tempting to huddle under a blanket, order a pizza and wait for the worst to pass. But there are also plenty of ways to cash in on such an epic storm, from shoveling driveways to offering transportation. Be sure to check the legalities in your area — and have proper insurance and signed liability waivers when necessary — but prepare to make some money when the snow falls. Most people won’t be out and about during a big blizzard, so think about how to reach potential customers at home with your advertising. Use Facebook to run a hyper-local ad campaign targeting your neighbors. Post your services on Craigslist, local online community boards or neighborhood Facebook groups. Or take the old-school route (which is still effective!) of going door-to-door, passing out flyers and explaining your services. When this much snow falls, you can count on days of shoveling following the storm. While shoveling sidewalks and driveways (and digging out cars) is physically taxing, it can also be lucrative. The going rate for snow shoveling is $25-75 per hour. Many people have no desire to spend a few hours shoveling their home out after a storm, and others are physically unable to do so. Consider offering a special deal (or free shoveling services) to low-income senior citizens or others who may be unable to clear their own snow. It’s a great way to get some buzz while doing a good deed, much as the owners of Portland Oregon’s Plaza Cleaners discovered when they received a massive amount of positive publicity for offering free dry cleaning to unemployed people with upcoming job interviews. YouTube offers tips and techniques on the best ways to shovel snow. Be careful to use proper techniques so you don’t get injured! Snow blowers are also worth their weight in gold. To go the extra mile — and maybe earn a tip or two — sprinkle ice melt on sidewalks and driveways. Also, leave a card or small flyer with your customers. You can print them out cheaply at home or order affordable business cards from Vistaprint at 100 cards for $16. 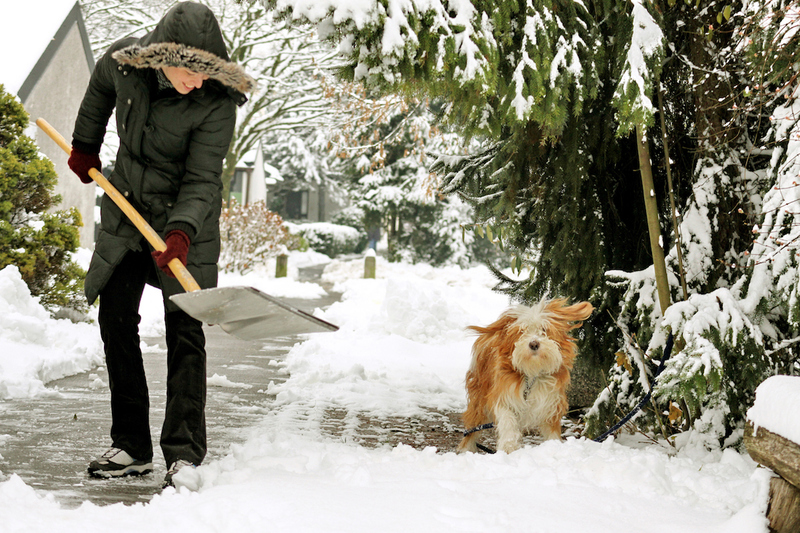 Next time there’s a storm, your clients will have your information handy, and they’ll also have it at the ready to pass along to friends and neighbors, telling them about your great shoveling job and attention to detail. While most anyone can shovel, operating a plow requires specialized training and equipment. If you have a truck equipped with a plow, plenty of people and businesses will hire you to clear snow. Look to local businesses with large parking lots and residents with long driveways as your primary customers. Operators typically charge $30-65 per driveway — more for especially long and curvy driveways. Where I live in the Rockies, we typically receive more than 500 inches of snow per year. Plow operators here in Jackson, Wyoming, generally contract with clients at the beginning of the season and agree to terms, including when to plow, which is typically when there are four or more inches of snowfall. Each time we have significant snowfall, the operators automatically plow, with no need to even call the property owners since the terms were set up in advance. A big storm is also a great time to start your snow plowing business. Have cards or flyers ready to hand out, and be sure to keep track of your clients’ information so it’s handy for next fall (when you can contract them for the next winter season). If you come through for them when they really need it, that’s a great way to begin a longer-term contract. Just because most transportation has ground to a halt doesn’t mean people don’t still need to run errands. From medicine deliveries to stocking up on extra groceries, people still need a few essentials during the storm. If the roads are in decent shape, and you have a four-wheel-drive vehicle and good winter driving skills, consider running errands for neighbors and other customers. Even if the roads are closed and impassable, if you have a good set of cross-country skis (and possibly a sled for larger hauls), you can still get around (and get a great workout) while running errands for people. You might even consider teaming up with a store that is open (or a pharmacy) to offer your delivery service. You could either market yourself on your own or take advantage of a service like Task Rabbit that will match you up with people who need help running errands. While there might be strict rules about transporting some types of medications, if someone just needs some more Nyquil, that’s an easy request for you to deliver. Also, consider teaming up with restaurants to offer special snow delivery (via skis when necessary). If you live in a climate that doesn’t normally have a lot of snow, you might not have great tools for clearing it. Heavy-duty snow shovels, snow brushes, and ice scrapers are a few things that are hard to come by if you live in a normally fairly temperate climate. Next time you’re on vacation in an extreme climate, stock up on some of these heavy-duty items (or order them online), and have them ready to sell (or rent) next time a big snowstorm comes around. Apps like letgo make it super easy to sell stuff online. Shoveling with a sturdy, reinforced, heavy-duty shovel makes a world of difference over attempting to use a dinky $2 shovel one that cracks and snaps halfway through. While people might easily shell out some cash for a sturdy snow shovel, they may only want to rent a snowblower for a short length of time. Consider renting out snowblowers, and other winter gear, even heavy winter clothing. Also, consider renting out “snow toys,” including skis, snowshoes and sleds. Cook up a pot of chili, bake some homemade cookies, brew up some coffee and hot cocoa, grab some bottles of Gatorade, and go around selling refreshments to people hard at work shoveling snow. Put together a few pre-made s’mores kits, including graham crackers, chocolate, marshmallows and skewers, and market these to families with stir-crazy kids who would love to find a family-friendly and memorable way to enjoy the storm. S’mores kits are selling for around $30 online (plus shipping), so providing door-to-door service should be worth a premium. In addition to providing cozy ambiance, firewood can provide a valuable heat source if the power goes out. With high winds and ice, there’s a good chance a blizzard will lead to an outage, so be prepared. By offering firewood, you can help your neighbors stay warm and make money. Have several delivery options in mind. If the roads close, using cross-country skis and a sturdy sled with a tarp bungeed down over the wood, you can offer a premium (and profitable) delivery service. Urban dwellers are especially likely to purchase pre-chopped firewood. In many parts of Washington, D.C., for example, people go door-to-door selling firewood, and residents snap up the wood for their fireplaces at a rate of $50 for two stacked piles. Make it easy for people, and they’re likely to buy. Be sure to include some kindling and your card in case they want a re-supply. Every time there’s a huge snowstorm, countless travelers are stranded. Some storms can cancel flights for days, leading to chaos for travelers. But there are ways to make the experience of being stranded a positive one for travelers. If you’re comfortable with the idea of renting out a room, consider putting people up in your home for an affordable rate. Try a service like Airbnb, and you could earn a few hundred dollars. This works best with someone you can verify, but some people are comfortable hosting strangers in their home, too. Another option is to provide snow-related activities for stranded travelers. Offer sled rentals or snowmobile rides. Getting out and enjoying the snow is far more pleasurable than being holed up in a hotel room, watching daytime television all day. Take photos and videos from the storm and sell them to news agencies. If you have truly exceptional storm photos, call up your local news stations and publications (even national ones) and offer to send a watermarked version for their consideration. If travel is snarled, news crews can’t be everywhere, and they may be willing to pay for your epic storm photos. Also, look into stock photography options, where you can earn $1 or so per photo. Just because there’s a giant storm doesn’t mean all parents can stay home from work. Offer your babysitting services to neighbors and friends, watching their kids if they’re called off to work, and earn around $15 an hour. You can even promote the fun, snow-related activities that you’ll do with the kids, including sledding, making snow angels, building a snowman and making s’mores. Some pet owners have to head to work during a big storm, and others are physically unable to walk their dog through large snow drifts. When their dog is at home bouncing off the walls, pet owners may want to hire someone to take their pup for a walk. A pair of snowshoes or skis can certainly come in handy for storm dog walking. And, if the winds are blowing, some pets will be scared if they’re home alone all day. Offer to care for pets in their home or yours. You can even watch several pets at once, increasing your earnings. Just because the city has shut down doesn’t mean no one has to get anywhere. Offering transportation via four-wheel-drive or snowmobile can be a lucrative service during a big storm. One friend had a colleague who desperately needed to get somewhere during a big storm, and a neighbor provided a snowmobile ride down their two-mile-long driveway to get to the main (plowed) road. Another option is to throw some chains on your tires, shift into four-wheel drive and drive with Uber to get people where they need to go. Take advantage of a day home from work to make money online instead of watching a Netflix marathon. Use the time off to create and sell a short course, sign up for special offers, or even cash in on playing video games. You don’t have to go online to make money at home. Take advantage of a snow day to clean out your closets and garage, seeing what you might be able to sell. Search for old comic books to sell (and maybe even make $8,000), find clothes to sell on consignment, and search for ’80s and ’90s toys to cash in on. Use the snow day to knit, crochet, quilt, create clothing or bags, or whatever strikes your fancy. Market these items online or sell your creations in local shops. You might even take advantage of a snow day or two to pick up a new hobby that can turn profitable. For example, learn how to knit, or even practice repairing your own clothing. Create a design or two about “Surviving the Snowpocalypse” and take to Cafe Press or another on-demand printing site to produce storm souvenirs. Create beanies, T-shirts, mugs, or other items that might appeal to a few locals, and could be a hit with big-city tourists. You may want to keep your design broad enough to apply to people throughout the storm-hit region. Put up a few ads on Facebook and other services, and sell your products in shops online and at local retailers. Voila — you’ve created a clever online business! Demonstrate your favorite snow-shoveling technique or show off your epic snow castle on YouTube. Create a viral snow-related video or learn from Grumpy Cat’s owners about how to make millions via YouTube. Blizzards pack a punch and, with high winds, they can leave a trail of wreckage and damage. Help your neighbors out and make a profit by offering your services to clean up the mess and repair the damage. From chopping and hauling away downed trees (which you may be able to keep for firewood), to repairing downed fences, and picking up wayward shingles that have blown off roofs, there is plenty of work to do after a storm. Your Turn: What’s your favorite way to earn a few extra bucks during a snowstorm?